Roberto Carvallo bested a competitive field of 382 players to take down the 2017 Punta Cana Poker Classic Main Event for $97,590. The Chilean’s career-best live outing concluded with a heads-up final table chop alongside Michigan’s Jamin Stokes, who also collected $97,590 cash for his effort, with final day chip leader Santiago Soriano of Spain placing third for just over $50,000. The $1,650 USD buy-in event easily surpassed $500,000 in total prize pool money, with the nine-handed final table playing out within the eastern Dominican Republic tourist-friendly region. A total of 45 players cashed in the PCPC Main Event. The $97,500 cash prize is by far Carvallo’s largest live tournament take of his short career. In May of this year, he competed in the inaugural PokerStars Festival Chile and took home $7,450 upon winning Deepstack Event #20. Carvallo was down to ten big blinds once the final table played down to six-handed action, but bounced back after his A-J outflopped his opponent’s A-Q to survive. The young Chilean was also able to best Soriano in an all in pre-flop scenario three-handed when his king-jack defeated the Spaniard’s ace-four thanks to a fortunate turn card. 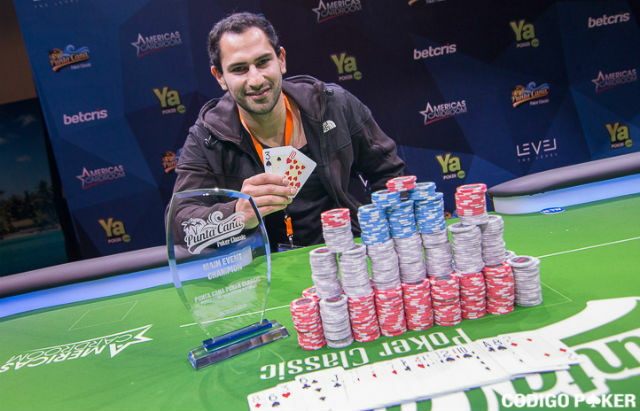 Once heads-up, the young Chilean and his American counterpart battled back and forth and eventually played down to similar chip stacks — which is when the duo decided to chop the prize money evenly before the trophy winner was determined. The final shove saw Carvallo’s outperform Stokes’ on a runout for the win.